Gallus Desidenius was an Imperial thief who became Guild Master of the Thieves Guild in Skyrim during the Fourth Era. He purportedly maintained strong ties with many influential families in Skyrim, which allowed the Guild to operate relatively safely. He was also a member of the Nightingale Trinity, along with Karliah, with whom he had a romantic relationship, and Mercer Frey. The three of them swore an oath to Nocturnal to protect the Skeleton Key, which holds the Ebonmere portal open at the Twilight Sepulcher. Gallus was the author of The Nightingales. Over time, Gallus became suspicious of Mercer's behavior. Mercer, in turn, became aware of Gallus' scrutiny. Though he was unable to find hard proof, Gallus became convinced that Mercer was responsible for desecrating the Twilight Sepulcher and stealing the Skeleton Key. Before he could dig any further, Mercer arranged a meeting, where he betrayed and murdered Gallus. Gallus' spirit became the last of the Nightingale Sentinels and defended the Sepulcher alone for about 25 years. For more information, see the lore article. Gallus's only actions in the game are to provide guidance to you upon entering Twilight Sepulcher during the quest Darkness Returns, and to reunite with Karliah immediately after the quest is completed. 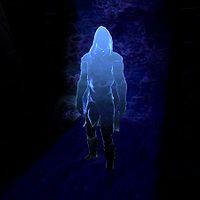 His final task complete, Gallus is then released from Nocturnal's service, and allowed to become one with the Evergloam, to which his spirit then departs. As a ghost, he wears a full set of unplayable Nightingale armor. Darkness Returns: Walk the Pilgrim's Path and return the Skeleton Key to its rightful place. He is voiced by Craig Sechler. If you attack Gallus while he is speaking to Karliah, he will behave like an essential NPC. Karliah will even join you in attacking him. However, after a few seconds of combat, he will disappear from the game. You can still engage Karliah in conversation normally after this. In-game, Gallus is referred to as a Nightingale Sentinel before identifying himself. There's a skeleton at the end in Snow Veil Sanctum, which may be the body of Gallus. This page was last modified on 21 August 2017, at 00:29.